An Oregon TV station reports Amazon has cautioned it against using some of the eclipse-viewing devices it purchased from the site. According to an email to KGW-TV, the online retailer said it could not confirm the solar filters purchased by the station's photographers were safe for viewing the eclipse. “We recommend that you DO NOT use this product to view the sun or the eclipse,” the station quotes the Amazon email. The station also reports that at least a dozen viewers reported receiving a similar email from Amazon over the weekend, advising them not to use the solar glasses they had purchased. Portland is in the 70-mile wide total eclipse zone, and stores selling solar glasses there, and elsewhere around the country, have sold out as the August 21 eclipse day approaches. 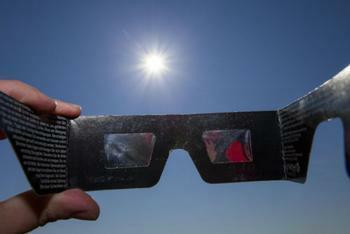 Glasses used to view the moon passing between the earth and the sun must be ISO 12312-2 certified to be safe. KGW reports the filters it purchased from Amazon bear the proper certification, but that Amazon said it could not confirm that the item came from a recommended manufacturer. Amazon told the station that it is offering refunds to consumers who purchased the eclipse glasses and is recalling them "out of an abundance of caution." Amazon told the station that consumers who purchased glasses but have not received an email announcing the recall purchased glasses known to be safe. Those who receive the email, it said, should not use the glasses to view the August 21 total eclipse. NASA has advised that the only safe way to look directly at the partially-exposed sun during the eclipse is by using special-purpose solar filters, such as “eclipse glasses”or hand-held solar viewers. "Homemade filters or ordinary sunglasses, even very dark ones, are not safe for looking at the sun; they transmit thousands of times too much sunlight," NASA warns.